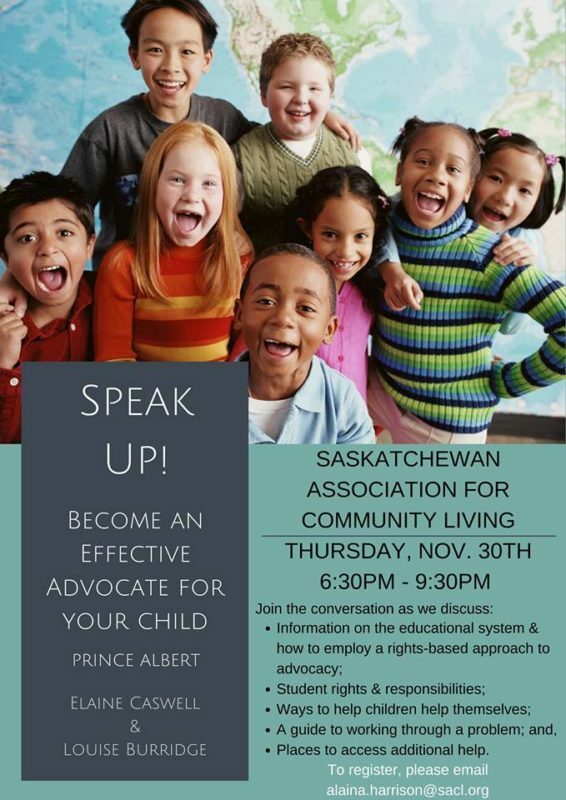 The Saskatchewan Association for Community Living (SACL) is proud to present: Speak Up! Become an Effective Advocate for Children and Youth. This workshop is facilitated by Elaine Caswell and Louise Burridge and is targeted for families with children still in school. You are your child’s advocate. In this informative workshop, gain a better understanding of your child’s educational rights. Come and learn useful tips and successful approaches from professionals with many years of experience working within the school system. When: Thursday, November 30th, 2017 at 6:30-9:30 p.m.
Where: Prince Albert: Knight Hall, Plaza 88 (888 Central Avenue). Free parking is available in Plaza 88’s parking lot. The main entrance is off the parking lot. Cost: The event is sponsored by the SACL and is FREE to attend. This entry was posted in Speak Up! and tagged activity, high school, middle school, school, teens.